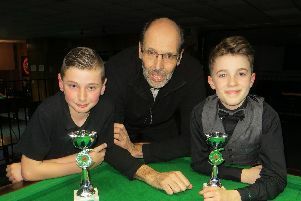 Waterlooville Allstars accelerated to pole position in Portsmouth & District Snooker League division two thanks to Colin Norton. The former England cueist made the game look easy as he hit a fine 76 break at Waterlooville Sports Club as Copnor E were beaten 8-4. Pascal Richard was also on song with visits of 68 and 40, writes Graham Simper. James Budd and captain Chloe White also won two each. The city side were saved by Norman Bradfield and Phil Ledington. Waterlooville D were knocked off the top as they lost to their C team at Aston Road. Gary Wilton and Zak Truscott provided the shock result with doubles in matches against Steve Wilson and Bill Phillips. It was back to business for Copnor D as they returned to action with an 8-4 success at Emsworth B.
Lee and Wayne Rendle gave Dave Glover great support after Dean Whiting had put on a good early show. Dave Chivers was happy with team-mates Jason and Steve Orchard as Pompey Royals recorded a solid 8-4 victory over Cowplain Gas. Paul Lees managed to win the last racks of the evening for the Gas. In the top division Portchester X broke their duck with a stunning 10-2 home triumph over Craneswater R.
Long-serving skipper Jason Tame wore a broad grin as Darren Inch, Matt James and Lee Gaylor joined him on the rostrum at Castle Street. Leaders Craneswater A took an early lead against Emsworth when Mike Talmondt sank breaks of 40 and 34. The next eight frames were shared then Tony Hansford beat Tommy O'Neil to make it safe. Second-placed Waterlooville A came from behind for their 8-4 win at Copnor A.
Mick Hall won the first two and Lee Eden took it to 3-1. Then the wheels came off as Jamie Wilson, Aaron Smith and Sam Tindall won six to take a 7-3 lead for Waterlooville A.
Scott Compton and Dusty Tingley shared the final frames to make the final score 8-4. Cowplain Z also won for the first time. They earned a 7-5 win as Bellair came calling. Heath Smith and Terry Hickley were on target for Cowplain but Paul Jagger kept it exciting. Tom Sproates, Ian Russell, Jamie Farrow and Matt Small were on form as Craneswater Q beat the Z side 8-4. Ade Binding and Mark Jones replied. Al’s Club and Waterlooville B are on top of division three after the latter picked up an extra point in a 9-3 win over Broadoak. Simon Fleming tried to save the Statonsiders but lacked support. Martyn Johnson, Keith Neil, Kelvin Connor and Colin Johnson all potted well. Kenny Morgan and Paul Ashmore showed plenty of their style as they guided Al’s Club to an 8-4 win over Cowplain B at Portchester. The Butler Boys showed they are back in the groove with an 8-4 win against Craneswater Dandy. Brian Elsegood bagged a brace for the city team but Martyn Williamson, Shaun Croxford and Geoff Burnard held their nerve. Cowplain Misfits are still seeking their first win but it is looking imminent after three draws. Dean Bates gave them a lead then Andy Chambers ran in a break of 40 to help Copnor Xcels escape with a 6-6 draw. Richard Burnett, Steve Scott and Bill Parsons formed a match-winning trio for Leigh Park. Alexandra Bowls kept it close with Karl Davies and Matt Sheath showing up well.